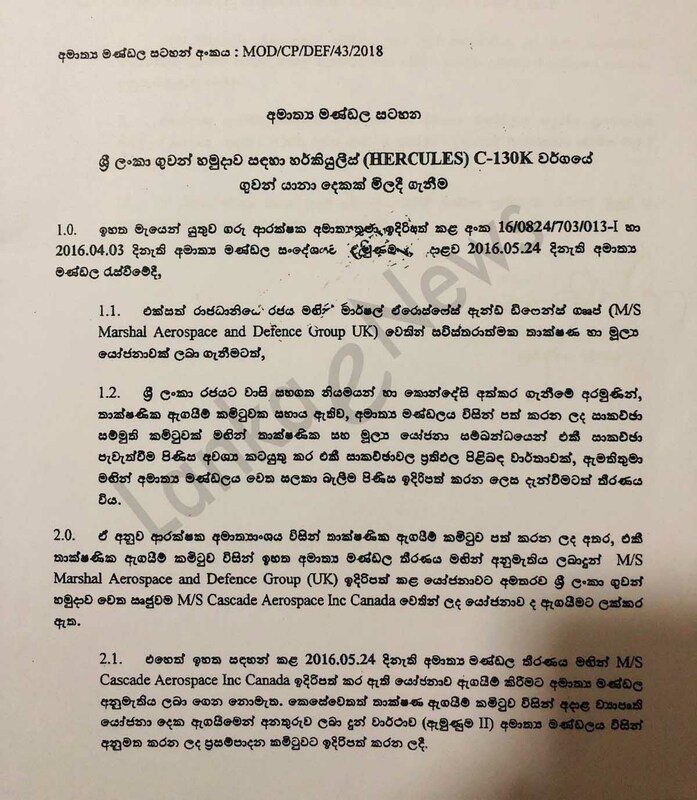 (Lanka e News -19.Oct.2018, 11.30PM) Yet another of president Gamarala’s colossal illicit commission collection to line his pockets has reached the inside information division of Lanka e News. This is the ‘Hercules’ illicit commission scam . commission payment when purchasing two air planes for the Air Force. 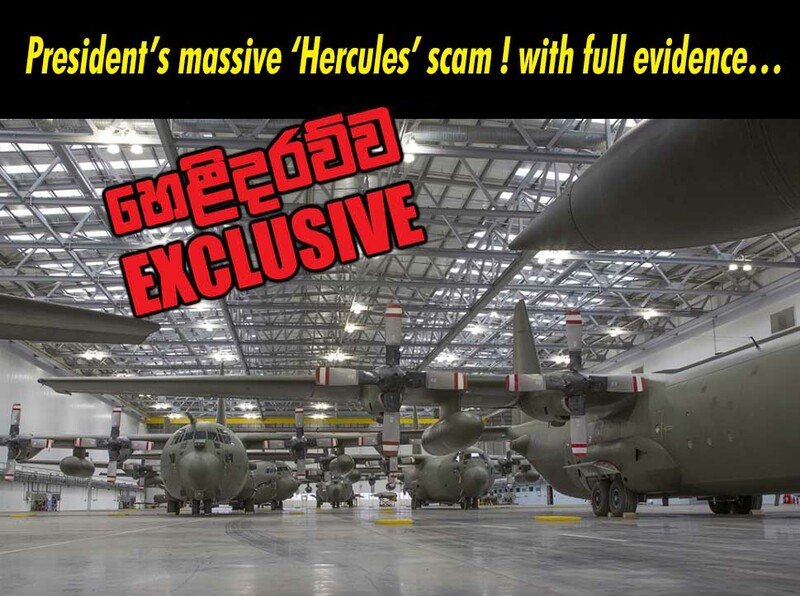 Sometime ago Lanka e news exposed another huge commission collection scam of president revolving round the purchase of a decrepit Russian warship at an exorbitant price. This time in the same way attempts had been made to buy two dilapidated air planes as old as over 50 years produced in the years 1967-68. These airplanes C 130 K Mk3 produced in the year 1960 were used by Britain’s Royal Air Force during the period of the Korean war way back in 2001. Now these are exhibits in the Air Force Museum in Cosford, Britain for public to view. This lot of old air planes discarder Force are purchased by Marshal Aerospace , Britain a private airline repairing Co. and after refurbishment are made available for sale to buyers. Many purchasers after buying these are using them for exhibitions , cargo transport etc. Unbelievably our president Gamarala has proposed to the SL Air Force to buy these two air planes fit for museums. Like how the former Navy Commander was given an extension in service to get the approval for the purchase of old decrepit Russian warship , this time the present Air force commander Kapila Jayampathy had been given an extension to get the approval for the dilapidated old air planes. 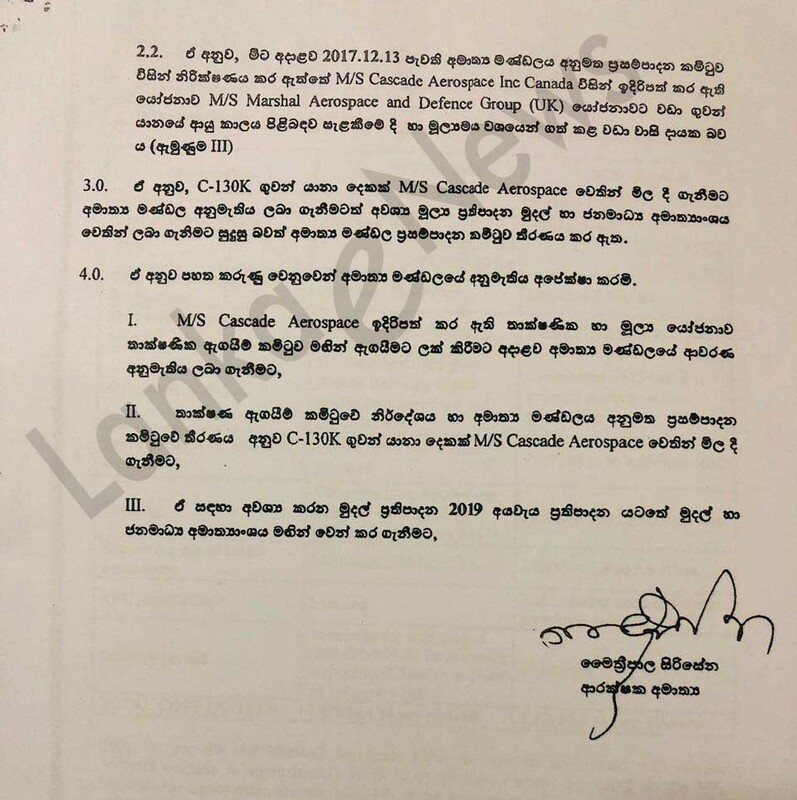 Jayampathy was recommended by Lanka e news for the Air force commander post , but later on he descended to the level of washing pots and pans at the residence of the president. It is a common joke among those in the Air force that president’s wife keeps all the pots and pans used in the night unwashed until Jayampathy arrives in the morning to wash them . This is because Jayampathy has made it a daily morning chore to visit the president’s official residence at Paget Road in his jogging kit . For washing pots and pans official uniform is a hindrance. President ‘s ‘Hercules’ commission is a staggering Rs. 2000 million! 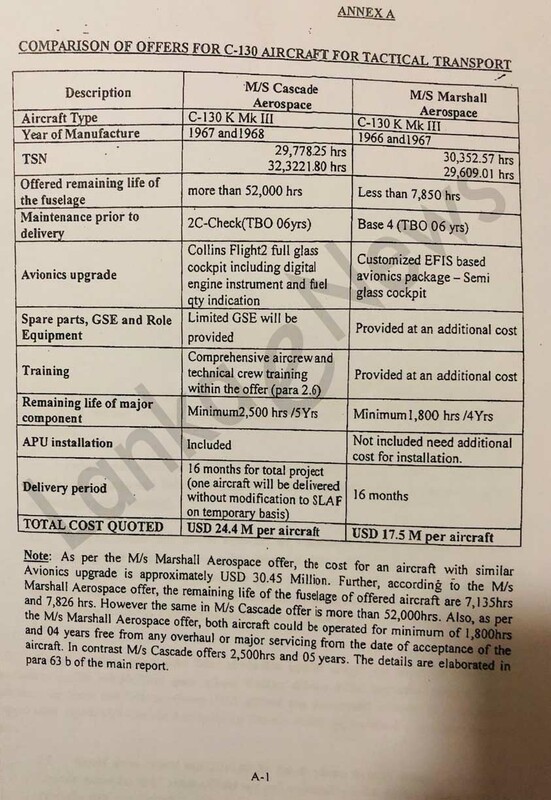 These two airplanes which have been refurbished by Britain’s Marshal Aerospace Co. had been offered at a low price of US dollars 17.5 million each. It is while these are the prices , the president is seeking to buy them through Cascade Aerospace Co. in Canada at much higher prices. The price of Cascade Co for a single plane is high as US dollars 24.4 million . That means US dollars 12 million (about SLRs. 2000 million) more has to be paid. The president has preferred to pay this high price and proposed to buy them. When the president tried to steer forward this cabinet paper MOD/CP/DEF/43/2008 on the 16 th , the cabinet has rejected the president’s proposal to purchase decrepit discarded planes. The ministers have stated, it is no purpose buying these planes which are about 50 years old at this colossal price of Rs. 8600 million because they were produced in the year 1967 and in the end those will have to be consigned to the Museum. Besides these ‘antique’ planes will have no buyers at the time of sale, the ministers have pinpointed. What is perplexing is , why couldn’t the president himself make this analysis being the head of the state ? Obviously commission motive had obscured his thinking in the national interest. 50 weeks lasting president hastening his illicit earnings ..
With a president who is having only another 50 weeks before he is packed home , he and his family who are aware of this are frantically amassing wealth through illicit earnings in an unholy haste before their exit . The UNF the main constituent party had however been bitterly resenting and opposing this ,leading to conflicts between the president and the UNF government . The president suddenly disbanding some director boards without informing the relevant ministers on the17 th was a sequel to that.